Say ‘Aloha’ to the perfect summer dog filled with sweet, salty, spicy and umami flavor. 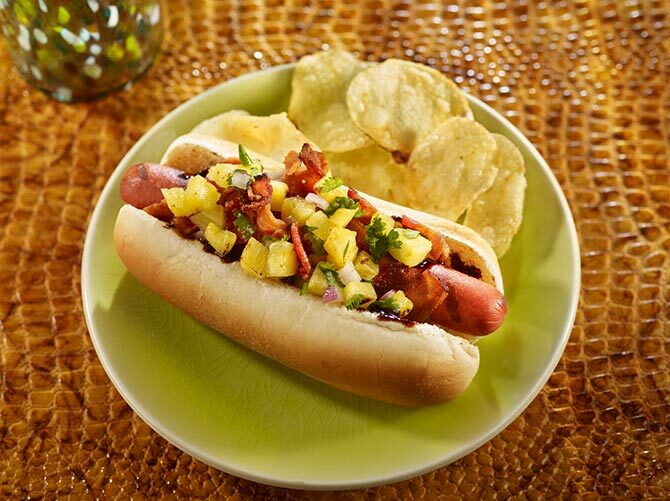 Grilling the pineapple along with the Hoffy bacon and beef franks creates a delectable celebration anytime! Pre-heat BBQ to medium-high heat. Once hot, lay the strips of bacon on the grates and grill, turning often, until crispy. Place the pineapple spears on the grates and grill until char marks appear on all sides. Remove the bacon from grill and let cool, then rough chop into bite-sized pieces. For the Pineapple Salsa, remove the pineapple from grill and let cool. Dice pineapple into small dice and place it in a mixing bowl. Add the minced red onion, jalapeno, chopped cilantro, lime zest, lime juice and honey. Season with salt and toss to combine well. To serve, grill the HOFFY XXL Beef Franks until heated through and grill marks appear. Assemble by placing a grilled HOFFY beef frank in each bun. Top with HOFFY crispy bacon and pineapple salsa. Drizzle with hoisin sauce, garnish with chives and serve.